Hi I'm George Schumann. 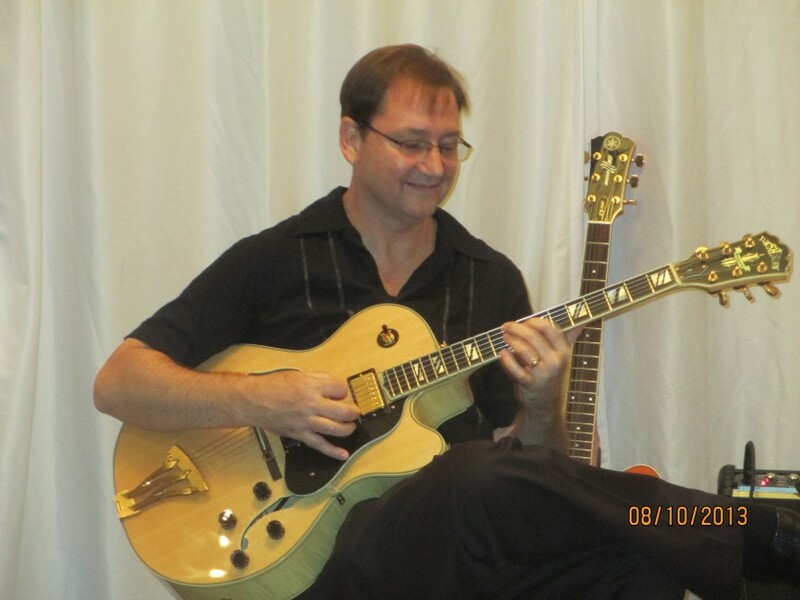 I play solo jazz guitar arrangements of popular love songs and jazz standards. Perfect music for weddings, restaurants, and special occasions. All instrumental music, soft, quiet and elegant, perfect for guests to enjoy while being seated pre-ceremony, and during cocktail hour, and dinner. I wanted a guitarist for the ceremony/cocktail hour of my wedding in October. George was nothing but professional, fun, and quick to respond. I had requested a couple songs to be played for the ceremony and he learned them for our big day! About a month or so before our big day, he invited my fiance and I to a sushi restaurant where he plays. He played our our songs for us while we sipped on wine and ate sushi. He was amazing! He played our cocktail and our ceremony and we got so many compliments on his playing skills. He was A HIT at our wedding. I strongly recommend...he was willing to travel 50 miles to play our big day, and I can't thank him enough because I couldn't have imagined having someone else play our wedding ceremony. If you're in the Columbus area, I recommend George with Romantic Guitar. Thanks so much for such kind words, and thank you for allowing me the honor and privilege of being part of your wedding celebration! Congratulations! George performed during the ceremony at my daughter's wedding this past weekend in Columbus. Beautiful stylings of an eclectic mix.. Many of those in attendance commented on his lovely performance. George is wonderful to work with as well! Many thumbs up from this grateful father of the bride! Thanks so much for such kind words ! It was a privilege and an honor to be part of this special day! A professional and classy musical experience to enhance the ambiance and atmosphere of your occasion. You and your guests will be delighted! I started playing guitar in 1977 when I was 14, and playing guitar has been a passion of mine ever since. I have a degree in contemporary music (Five Towns College, Long Island, 1984) and I studied with great guitar players from New York to Columbus, Ohio. Now I teach guitar at a music store in Reynoldsburg! Over the years I've played rock, blues, jazz, reggae, and I still play contemporary Christian music at church. I love playing at wedding ceremonies all over Ohio, and I keep busy performing at restaurants around Central Ohio. I bring all my own equipment. All I need is access to an electrical outlet.